thoughts // start where you are. i know its been a while. too long, maybe for my one blog follower, but thank you for your patience. there’s actually a lot going on here on the backend. i’ve rerouted my goals. changed my mind. taken a step back. rethought a lot about this blog. guys – i go back and forth with the amount of blogs i publish each week. needing to find a purpose, a readership, a family. sometimes i feel like nobody is out there listening. but, you know what? its for the good. i dont have to to have the largest readership or even the best. all i know is that my content is true and its real. its genuine and natural for me. so what’s left? the initiative to start. to blog more. to keep at a goal. so, the quote you ask? what does it have to do with anything? my goal this week is to write 2 blogs. here’s one. and the other one will post early next week. i’m getting back into blogging. for the past several weeks i’ve been really set back. by so much. but guess what? i’m only one person with dreams to be built, conversations to be started, and a business to be built. sometimes we all need a little break. a refresh that we can can start over. so now, i’m starting where i am. finding peace in a new coffee shop. a refreshed outlook on life. wont you join me? Do you ever feel like you live by confusion? I do. Day in and day out at times I think… “What the heck am I doing?” Do you? Am I alone? I started thinking about this quote and thought gosh, I can’t be alone. Is it this creative lifestyle I live? Is it that I’ve had an incredible amount of change in the past 3 years… I’m just catching up? What am I doing? Then I started searching some of my favorite entrepreneurs, Whitney says this on purpose. Lara reviews her purpose each year, and totally examines it. Emily has great words on simplifying to find your purpose. Nancy practices purpose with contentment. I could go on and on. There’s so many amazing ladies ( imagine that … the stationery and photography world is run by ladies 😉 ) that struggle, just as much as I do. There’s hope. Right? So I’m back to the quote… “You live by the conclusions until they become clear.” This is finding our purpose. Determining where we are with what we have. Things always happen for a reason. Always. I’m just looking for that clarity. Are you? Helllllloooooo Friday! I’m so happy you’re here. This week, all I’ve been thinking about is the fact that my sister and mom are coming to stay in Atlanta to visit. Its a girls weekend, and I couldn’t be more excited / ready to do this! So, this weekend, I’m smiling big time! 🙂 have you seen my past friday smiledays? hello fun no matter what! ps – i’ll certainly be in the moment, won’t you use this hashtag too? I’ve found I’m really trying to be in moment. My husband is pretty much perfect at this. I, however, am not. I’m trying to realize little tiny moments of joy, and then capture them. Sorry they are via the iphone, but sometimes they will slip away if we let them. Today I encourage you to document that moment that brings you joy. This morning, it was about 8:30 am, the windows were open, I heard the birds chirping, the breeze came through from outside, and it was still. Solitude. Joy. Contentment. I sat in awe of God’s creation. On my couch, I sit and stare at my beautiful new lavender tulips. I’ve never seen such a thing like this and tulips are one of my favorite flowers for so many reasons. I’m content. I found joy. Today, I plan on thinking of this peaceful moment as my day goes on, and reach back for it. When I get frustrated or anxious. I have to remember to be in that moment. Have you had a moment like this? ps how do you balance every day? This morning I dabbled in a few ideas of blog posts… some being on my work, my life, a few roundups, etc. But then I just kept coming back to what is literally on my mind right now. I have been really thinking about the idea of change. Like, what it means to me, and how I do it when nothing seems to change, and how I can make it happen. Do you ever feel like this? You need change in your life, but you aren’t sure where its going to come from or what will make things better when you do change them? I think on this a lot. I dye my hair, I move my furniture, I go to a different location, I change something. So whatever change means to you ( large or small ) what do you think it does for you? It gives me new perspective. It makes me feel better. It makes me more inspired. It gives me hope. And peace. And joy. I was reading this blog ( new found love, holla! ) and I really started thinking about that quote – you can just wait for things to ( maybe ) happen, or you can go and make them happen. You can LET GO of the crap, and attack it from another angle. You can pray for God to change your location. Today I’m choosing to let go. Let go of all the negative reasons I’m sitting at home. For all the “why me’s” and “how did this happen.” I’m letting go and changing my outcome. 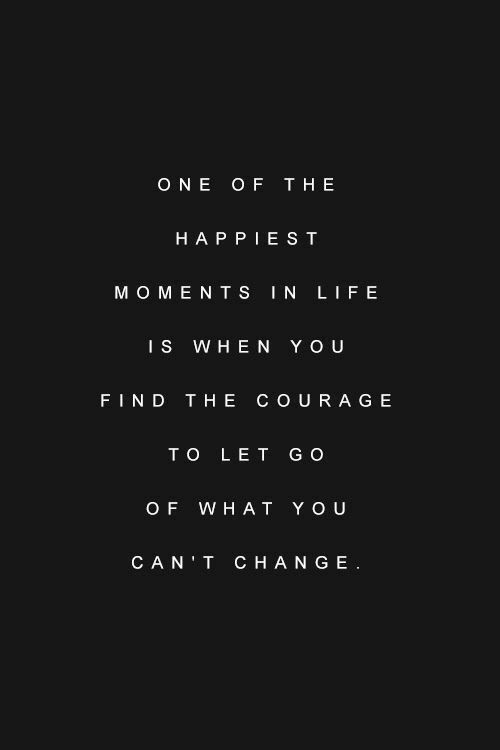 Or at least letting go of feeling like I can change everything or anything. Do you ever feel this way? ps – here’s a pic of my new change. Yes, today serves three purposes. First, and foremost, my beautiful mom’s birthday! Secondly – friday smileday ; and third – valentines day! You guys know how much I LOVE LOVE 😀 So about my mom… This woman is my rock, my favorite person, best friend, and my source of most of my humor. ( how many things do i just like her that CRACK ME UP? ) so many. She’s been there every single time I’m down, she answers my call even though its the 700th of the day, she listens to me whine, complain, laugh and cry. She’s the best mother I could ever ask for. I mean that with my whole heart. So, today mom, its all about you. I know its Valentines day, but you’re more important than that. That’s just a holiday filled with love ( that i love of course ) but more importantly, its YOUR day. I love you with my whole heart, and thank God daily for your heart and soul. You’re amazing. You’re uplifting, fun, crazy, hilarious, beautiful and full of love. You are the best mom I could ever pray for. I love you! just a little book to cheer you up. i adore this fringe komono.last minute DIY valentines idea for your sweeties. a simple valentines mani and a few colors to pick from. would love this valentines mimosa this weekend. three ways to write your own valentine. 6 valentines that are totally free. treat yourself to a natural face mask. Jessica and David are the perfect match. She loves a man who spoils her, lets her wear her crown. David does it. David loves a woman who is a little sassy, likes to have fun and just be her. Just seeing their relationship develop over the past several years, I can’t help but to be over the moon for her! Jessica and I go back. Until kindergarten. Yea, we’re that old – and that solid. And I’m so thankful for that. She’s one of my best friends in the entire world and I thank God daily for her. I have to start off with this image. We worked super hard to get the “money shot” but couldn’t do that photo until last. I was talking David through some of the photos and I came up with this crazy face I wanted him to make. This is the outcome, and probably one of the best images in the whole bunch. LOVED IT. Thanks David for being a trooper! So lets back up to Christmas Day, 2012. Hello is he not the most perfect planner boyfriend / fiance / soon-to-be husband EVER? Wow. Amazed! Totally totally enjoyed photographing them in Iowa at the Fireside Winery. We had a blast, took over the winery ( hello fantastic help and our team! ) and just drank wine while we photographed the afternoon away. We withheld seventeen degree temperatures for the whole day outside. With frozen toes and fingers ( from shooting of course ) we had the time of our lives. That’s what friends are about. Exploring, knowing, learning, loving, and growing. I couldn’t have been more honored to photograph Jessica and David’s engagement session. There is a special piece down at the bottom… we used for her “save the dates!” The remainder of that blog will be next week… so stay tuned! Stay tuned for the rest… next week!